Timely rains this year may have kept many from running their irrigation systems, but they could have also done much more than that. Moisture has kept many lawns from going dormant and heavy rains are most likely the reason for many weeds in the turf and in some cases, its yellow appearance. Yellow colored Kentucky bluegrass has been spotted all around the region. While we don’t know the exact cause of the yellow lawns, there are several factors that are known. The symptoms appear to only be affecting some cultivars of Kentucky bluegrass. It has not been seen in tall fescue or perennial ryegrass. The symptoms mainly appear only on the upper, young leaves. This discriminating coloration means that it probably isn’t a deficiency of nitrogen. Nutrients like nitrogen are mobile in the plant; if one leaf is affected, they will all be affected. Other nutrients like iron might be to blame as it isn’t as mobile in the plant, which can lead to spotty symptoms. On the turf that has been examined, there isn’t a notable lesion or spot on the leaf, which rules out many diseases and fungal infections. The weather we have had this season might be playing a role in the yellow streak. The symptoms are most often seen in lawns that are mostly irrigated or received more than adequate amounts of rain. They also happen when the soil temperatures are at their seasonal highs during wet summers. There can be some similar yellowing symptoms in the spring, but they are attributed to denitrification, or loss of nitrogen, in the soil. What can a person do? You will be happy to know that this sickly color only affects the visual appeal of the Kentucky bluegrass. It doesn’t seem to have any long term impacts on the overall health of the plant. No need to apply a fungicide, insecticide, or fertilizers with less than 0.5 pounds of nitrogen per 1,000 square feet. Reducing irrigation for the short term should help with this coloration issue. If you wanted to try to green up your turf, you could try a low rate application of iron. This could give you back your green color, without the use of nitrogen fertilizer, which isn’t recommended in August. Mowing could also remove a majority of the discolored younger foliage which is higher up in the canopy. Some longer term solutions might need to be considered if this turns out to be an annual occurrence. The main goal is going to include increasing drainage and reducing compaction. Core aeration is one way to increase drainage to lawns that are compacted, on heavy clay, or have heavy traffic. Another longer term option could include overseeding with a different cultivar of Kentucky bluegrass or possibly changing turfgrasses altogether. To get the best of both worlds, you can try both aeration and overseeding. Take advantage of the holes caused by core aeration and overseed at the same time. The rule of thumb is that for each week grasses are seeded before Labor Day, development is sped up by two weeks. The optimal window to seed cool-season turfgrasses is August 15 to September 15. Thin stands of Kentucky bluegrass should be overseeded with improved cultivars at .75 to 1 pound of seed per 1,000 square feet. If you are overseeding a tall fescue lawn, use a blend of improved turf-type tall fescue cultivars at a rate of 4 to 6 pounds of seed per 1,000 square feet. Ensure the seed has good seed-to-soil contact and irrigate frequently for the best germination. If your lawn has a yellow streak, don’t worry. A little time and a lot of patience will yield a greener appearing lawn. Elizabeth Killinger is the Horticulture Extension Educator with Nebraska Extension in Hall County. 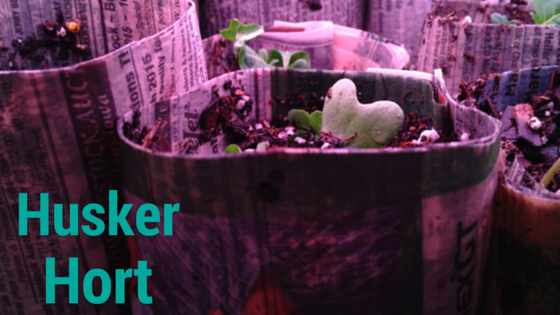 For more information contact Elizabeth at elizabeth.killinger@unl.edu, her blog at https://huskerhort.com/, or HuskerHort on Facebook and Twitter. Categories: Turf | Tags: fall turf fertilization, Nebraska Extension, yellow Kentucky bluegrass, yellow turf | Permalink. A Nebraska Extension Educator out of Hall County with a focus in horticulture and sustainable landscapes.